The Short Index Finger is anything that is shorter than half-way down the top joint of the Middle Finger. It indicates a self-doubt that can lead to a lack of self-confidence. It makes life more difficult. It takes tremendous effort and willpower to learn to cope with these feelings and to hide them from the world. Men learn to mask it. Being shy makes them anxious and being anxious makes them more self-conscious of their shyness. Because of anxiety in the workplace--the boss, other employees and the demands of the job itself--self-employment is a good choice for shy people. They tend to work hard and are driven to succeed. Sidney Poitier, John Lennon, Frank Sinatra, Michael Jackson, Elvis, James Dean, Martin Scorsese, Prince, Marlon Brando, Michael Moore and so many more were all born shy. They are also very private people who are only really comfortable when in character. And they make a success of it. Their self-doubt pushes them into a position of power and control where nobody can ever criticize or hurt them again. 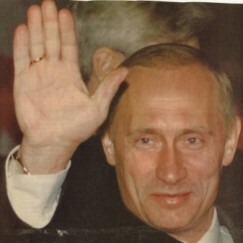 Ariel Sharon and Vladimir Putin have this finger formation. Their Short Index Fingers are found in powerful hands reflecting abilities that helped them get to the top. A politician with this finger will always react sharply to any kind of criticism… even seeing it where it does not exist. They will always want to be right. By contrast, such leaders as Ronald Reagan and Bill Clinton, with their Average Index Fingers, engaged in calm debate when attacked. Every person who is born shy learns to handle it his own way. Some become loud, others hide in a shell. These people take whatever talent, skill or ability they have, including their physical attributes, and make the most of them. Because those with Short Index Fingers are constantly worried that they might fail, they keep their skills honed, work hard to avoid criticism, and tend to be perfectionists. In other words, they are excellent employees in many ways. And it’s not that they lack people skills, but rather that they are so hypersensitive to any comment that it gets in the way of their personal and work relationships. You can’t joke about lateness to a Short Index Finger or he will think you are going to turn him in to the boss. Those with a Short Index Finger not only anticipate criticism, they actually expect it. The shorter this finger, the more reluctant the owner will be to ask for directions when lost, or help when he needs it. He will do anything not to risk the shame of being seen as less than competent, less than a man. These men work harder than anyone else to be the best in order to avoid criticism. For the women who marry these men, this information is the essential key to making a relationship with these men work. You can avoid the misunderstandings that can easily occur. You can’t change a man, but you can change the way you approach and interact with him so that you both benefit. It takes a great deal of patience to live with a person who is filled with self-doubt. At the same time, these people are among the most interesting, lively, sensitive and caring individuals you may ever have in your life. So don’t turn away from them because of what you see on the surface. Just beneath lies someone who is stronger and more fascinating for his suffering. What you have to do is find a way to gain his trust, and then his love will follow. And you can be his rock.